Summary: Difference Between Mass and Weight is that, In the sense of physics the definition of Mass is the quantity of inertia possessed by an object or the proportion between force and acceleration that is described in Newton Second Law of Motion. While gravitational force of that attract or pull any object towards its origin is called weight. By definition the weight is the force due to gravity is called weight of that body. In the sense of physics the definition of Mass is the quantity of inertia possessed by an object or the proportion between force and acceleration that is described in Newton Second Law of Motion. The SI unit of mass is the kilogram (kg) is commonly measured. A gravitational force of that attract or pull any object towards its origin is called weight. By definition the weight is the force due to gravity is called weight of that body. It is simple force that attract by the Earth toward its origin that is a force around nine point eight meter per second (9.8 m/s). Weight of anybody is simply related to the gravity force. It can be variable as the object far and near to Earth’s origin. 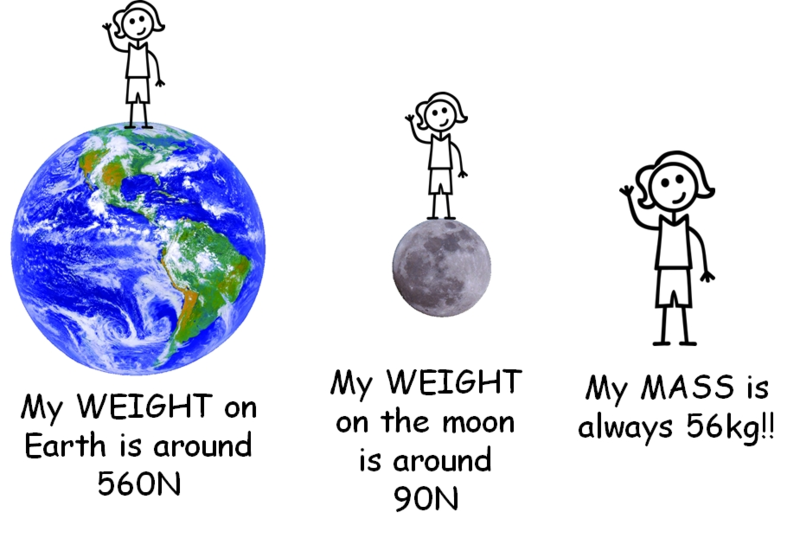 It is possible that an object have different weight at different points of Earth. If your are on Mountains it may be possible that your weight is less than the weight on ground level of Earth. The simple relation between weight and mass, this concept confuse people a lot. In fact the exact difference between weight and mass on the surface of Earth. The mass of any body remains same on the earth and moon and anywhere in space. Because it is due to the relationship of gravity that is related to the weight. The main difference between mass and weight is that if a person live on earth and went to moon or mars his mass remains same but his weight will change due to the force of gravity of the related surface of planet or moon. The mass of any object is constant on earth and space. It is a vector quantity that does not change. It does not affected by the gravitational force. It is somehow contradiction of weight as these are compared equally by common persons.